The Stewart's home overlooks Lake Pend Oreille. Lee and Myola Stewart's home overlooking Lake Pend Oreille was destroyed by a landslide in March 2017. 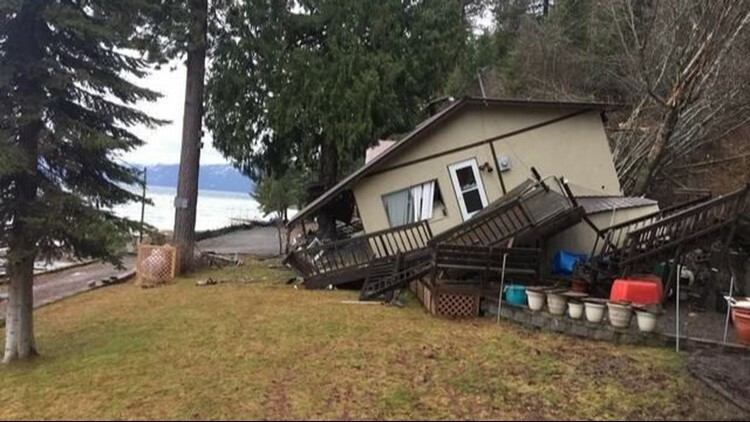 SANDPOINT, Idaho - A Washington couple is suing an Idaho county for a landslide that destroyed their vacation home. The landslide knocked the home off its foundation and turned it on its side. The Spokane Valley couple was not in the home when it was damaged. The couple filed a claim in 2017, seeking $367,265 in damages, which was the assessed value of the home. The claim was rejected, which permitted the Stewarts to file suit in 1st District Court. The couple is seeking a jury trial and damages which exceed $10,000, the statutory threshold for a district court action. Bonner County officials do not comment on pending litigation.